Wild Ocean Holistic Grain Free Entrée for All Life Stages is a complete and balanced formula intended for moderately active dogs and nursing dogs. Wild Ocean Holistic Grain Free Entrée for All Life Stages is the most nutritious food your dog will ever need and is perfect for small and medium breed puppies. 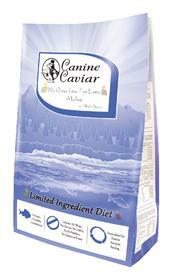 Beneficial nutrients aid in maintaining beautiful skin and coat in longhaired dogs. Ingredients:Herring Meal, Split Peas, Canola Oil (preserved with mixed tocopherols), Coconut**, Sun-Cured Alfalfa, Coconut Oil**, Sun-Cured Kelp, Dried Lactobacillus Acidophilus Fermentation Product, Sodium Chloride, Lecithin, Choline Chloride, FOS or Fructooligosaccharide (prebiotic), Fenugreek, Peppermint, Taurine, Zinc Proteinate, Papaya, Rose Hips, Yucca Schidigera Extract, Anise Oil**, Thyme Oil**, Manganese Proteinate, Beta-Carotene, Vitamin D3 Supplement, Biotin, Selenium, Riboflavin, Thiamine Mononitrate, Pyridoxine Hydrochloride, Vitamin B12 Supplement, Folic Acid.